Editor’s Note. 2017 Update: Marcy Products have released a later version, the 990. To see our review and comparison, just click the link. If you don’t have time to read the full review, Click Here to Go Directly to Amazon for Best Available Marcy MWM 990 Prices and any Discount. If you are wanting to improve your fitness and muscle development in the privacy of your own home, a Marcy gym offers the benefits of multiple exercise programs on a single piece of equipment. Click the item below to go to your most pressing question, or continue reading the whole article. 1 Editor’s Note. 2017 Update: Marcy Products have released a later version, the 990. To see our review and comparison, just click the link. 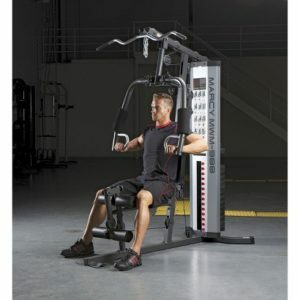 2 What Does the Marcy MWM 988 Stack Home Gym Offer? 3 Marcy Fitness Products, A History of Pioneering and Innovation. 5 Will it Fit in My Home? What Does the Marcy MWM 988 Stack Home Gym Offer? This is a compact home gym machine incorporating multiple training equipment for a variety of individual fitness programs. The gym has the following major features. Good for all the family. high and low pulley stations, more types of exercises for upper and lower body. Marcy home gyms are solidly constructed with 14 gauge steel tube frame with solid steel. Its compact design will fit in a space with Height 78″, Length 68″ Width 35″. The Home Gym comes in packages and is easily assembled at home. Marcy Fitness Products, A History of Pioneering and Innovation. Dr Walter Marcyan began designing and building gym equipment over 75 years ago. His Company Marcy Fitness Products is one of the first and oldest fitness and gymnasium equipment companies on record. 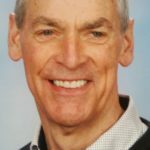 Dr. Marcyan established his House of Health in Los Angeles in 1946, offering personal training, full gym facilities with a juice bar, sauna, steam room and game room. It also offered the first dedicated women’s training in a separate gym. In the 1960’s the company developed the first home gym machine called “The All-in-One”. They have been a leader since then in manufacturing multi-station exercise machines designed to fit easily into average size rooms at home. The Marcy home gym machines are noted for their innovative design, quality of construction materials and compact structure. The following is an overview of user feedback, sourced from several reviews. A 48 yr old found it effective for upper and lower body training, and suited his needs to help tone muscles and provide a balance to a sedentary work style. As a mid range piece of equipment, he was pleased with the sturdy construction and the way it sat firmly without wobbling when being used. Another buyer found it an “awesome home gym!“, perfect for basic conditioning for a beginner. One user was pleased at how easy it was to put together, even with a 4 hour assembly time. After daily use for 3 weeks, they could see real improvement in fat burning and strength. After 3 months of moderate but consistent use, another user was feeling healthy and toned. Amazon Reviews have rated the Marcy MWM Stack Home Gym Machine 4.2 stars out of 5. Buyers of this product have overwhelmingly rated it as a good product. 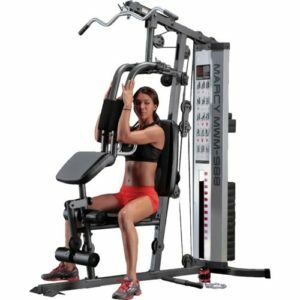 Marcy Fitness Products are also committed to providing high quality, innovative compact home gym equipment at an affordable price in order to support the fitness of all people. The basic dimensions of the Marcy MWM 988 stack home gym are: Length 68 inches, Width 35 inches, Height 78 inches. Positioning against a wall it is useful to know that the pillar holding the weights is 14 inches wide. So, basically not a lot of room required, and great benefits from the addition to your room or garage. The Marcy MWM 988 Stack Home Gym is a compact and versatile machine that enables users to carry out specific workouts for particular muscle strength training, conditioning for core muscles and general toning for the whole body. This gym is ideal for overall fitness and muscle development but I would not recommend it for extreme bodybuilding and bulking up muscles. This is very much a training machine for the beginner and the whole family. The compact design of this exercise machine makes it ideal for a room in the house or the garage. It enables all of the family to work on their own training program, with a variety of exercise options to help maintain interest and motivation. Beginners and serious home fitness trainers will find this machine an excellent centrepiece for their home gym. Most buyers and users of the Marcy MWM 988 Stack Home Gym see it as a high-quality product at an affordable price. Editors Note. The Marcy 988 is currently unavailable on Amazon. You can see our review of the update Marcy 990 here.